Hi! Thank you for visiting my blog. I created this clean and simple card using Bambi Bubble Gum from Kraftin' Kimmie Stamps. I colored the image using Spectrum Noir pens. I added a little bit of glitter to her hat, belt and shoes. So fantastic Mary, love the red, white and blue! Fun image and wonderful colors. Thanks for joining us at Seize the Birthday! Oh, this is just so fabulous! I am loving it! Thanks for sharing and joining us at Inspiration Destination Challenge Blog. Hope to see you again and good luck! Fun image, great coloring and fabulous overall creation! Thanks so much for joining us at The Sisterhood’s ‘BIRTHDAY’ challenge and please come back again soon! Love the red, white and blue color scheme. Fabulous layout. Thanks for joining the Sisterhood's "Birthday" challenge. Outstanding sassy girl image. The colors are my fav and you did a great job with the sparkly hat. Good luck with you entry at Penny's Paper-Crafty Challenge. Fabulous card, I love the image and wonderful design. A lovely clean and crisp design Mary, works so well with your choice of colours. 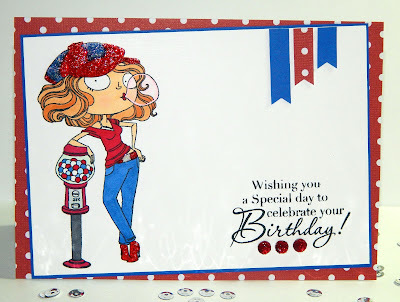 Such a cute image and I love the clean lines of your card! Thanks for joining us at The Sisterhood of Crafters! Very cute. This is one of my fave Kraftin' Kimmie images. Thanks for sharing with us at Little Red Wagon this week. Super cute!!! Beautiful coloring! Thank you for joining us at "The Sisterhood" for our birthday challenge! Cute! Love the glitzy hat and tilted panel. Thank you so much for joining us in our Paper Sweeties Red, White & Blue Inspiration Challenge! This is such a fabulous card! Love the image and CAS style. Thank you for joining us at Paradise of Stamps, good luck and I hope you will join us again. This is just lovely Mary. I do love this KKS image...a little sweet and a little sassy. Very nice. Thanks for joining us at Inspiration Destination. Good luck. Absolutely adorable card! I love this image! Thank you for playing along in the Word Art Wednesday Challenge! Have a blessed day! It's A Summer Stampin' Party!! !